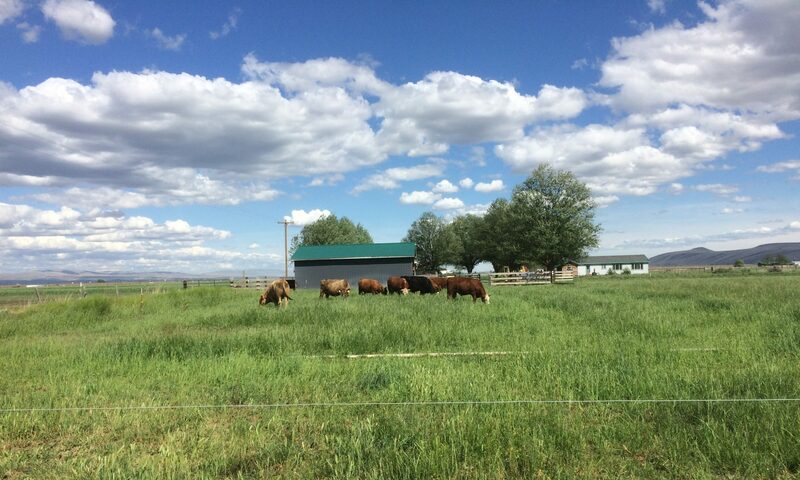 Raising grass-fed beef at JustLiving Farm is simple. Feed grass and keep it natural. We believe quality beef comes from allowing cattle to eat grass from the moment they are weaned from their mama. Our pastures and hay fields are a mix of grasses, clover, and natural occurring plants. During the summer months cattle rotationally graze our pastures providing good plant and soil health. During this same season, we raise grass and alfalfa hay without the use of herbicides or pesticides. When the summer month pass and winter arrives, our animals are turned out onto the hay fields. They roam and eat freely while we supplement their diet with our summer grown hay. These practices assure our animals, plants, soil, and water are well treated. We constantly work to provide excellent living conditions for every animal. We believe well cared for animals who live stress-free lives provide meat whose texture, marbling, and taste are beyond measure. Simply, we think cattle who roam free, eat naturally, and drink good cool water, taste better. We do not take our responsibility to our animals and you lightly. We run an open farm which means if you would like to visit, talk, and inspect what we do, just give us a call to set a time to visit. In the meantime, know that to ensure our animals a good life and you good beef, we walk our pastures daily, pay attention to the plants they eat, the water they drink, and the soil on which they live. Ready to Reserve a Beef? Simply want to have a conversation before committing? Call Dave anytime. If we’re in the field we will call as soon as we can—(509) 969-2093. OR fill out the form below and give us a date you would like to visit.